During a civil or criminal legal case, the prosecuting side needs to present evidence to a judge or a jury. Each individual piece of evidence doesn’t have to prove the innocence or guilt of the party being tried by itself, but the combination of that evidence has to meet a certain standard. For a criminal case, the standard is beyond a reasonable doubt. For a civil case, it’s a standard of more probable than not. So, criminal cases tend to require higher levels of confidence. When Google collects information on the Web about an entity, for their knowledge vault, they want that information to be as trustworthy as possible. If you’ve read anything about Google’s introduction of the knowledge vault, one of the points about it that stands out is that there’s a high level of confidence in the information listed. There is more confidence in the facts that are associated with entities than there might have been in the Knowledge Graph. There’s more confidence that the entities listed are unique and different from other entities in the knowledge vault. In Extracting Facts for Entities from Sources such as Wikipedia Titles and Infoboxes, I wrote about patent from Google that discussed how it might take facts about a particular entity from sources such as Wikipedia. The confidence that those facts applied to a specific entity involved analyzing Wikipedia’s structure, its use of page titles that included the entity the page was about, and the use of an infobox on that page that contained facts about that entity. This post is about a patent from Google involving entities and the Semantic Web, and how Google might choose facts from sources that it has a higher level of confidence in, and where it looks for evidence of that confidence. When Google “finds” facts about an object or entity, it usually includes the source of that fact in its index entry for that fact with the unique object it is a fact for. The “Extracting Facts for Entities” patent I wrote about mentioned this patent as a “related” patent. They both share Shubin Zhao as an inventor. This patent specifically looks for proof of the “subject” of a source document. If I want to collect facts about Pete Rose, the baseball player, to include in a knowledge base entry about Pete Rose, I will likely try to collect those facts from pages about Pete Rose. Not a page about Joe Morgan, or Tony Perez, or Johnny Bench or other baseball players who might have played with Pete Rose, even though they may contain some information about him. A page about Pete Rose is likely a good source of trustworthy facts about Pete Rose. If the facts are important facts about Pete Rose, they should be on a page about him. Especially if that page is on the same domain about both Pete Rose and the other players on the team. So imagine that there are a bunch of pages on an authoritative site about the baseball team, and each player has his own page, such as “Pete Rose – Cincinnati Reds – Official Home Page” Or “Joe Morgan – Cincinnati Reds – Official Home Page”. The fact that these pages are on the same domain, or a sub-domain on the same domain, or share the same IP address means that they are peer documents. The process in this patent is looking for pages on peer documents. It’s another sign that the pages are related in a meaningful way, increasing their value as evidence, and their confidence. Those peer pages may also use players’ names in anchor text pointed to the pages. So the page for Pete Rose mght use “Pete Rose” as anchor text in a link pointed to the page. 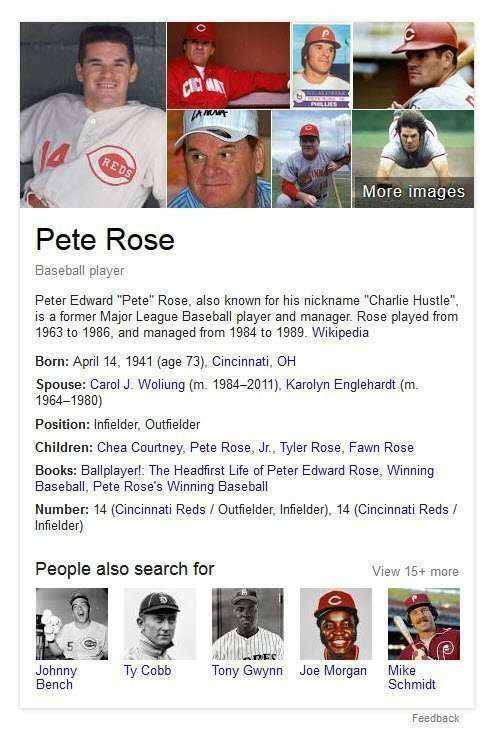 In the knowledge base information on facts for the entity Pete Rose, the URL for the page where facts were extracted can be included, and the subject of “Pete Rose” can show that the page was about Rose. A system and method identifies a subject for a source document. The system and method identifies a collection of peer documents from the same domain as the source document. For each of the peer documents, a collection of linking documents containing a hyperlink to the peer document is identified. For each of the peer documents, a label is generated by choosing the longest-match anchor text of the linking documents. This patent was filed many years before Google came up with the idea of a knowledge vault, but the idea of finding the best source for facts possible was around back then, too. while collecting the facts about an entity what are the things we have to keep in mind..
Next Next post: Was Google Maps a Proof of Concept for Google’s Knowledge Base Efforts?